Home/LIFESTYLE/FASCINATING WEDDING TRADITIONS FROM DIFFERENT PARTS OF THE WORLD. When two vagabonds decide to get married, the wedding is expected to be ‘Travel matic.’ Bringing you the list of fascinating wedding traditions from different parts of the world to help you find inspiration beyond geographical limits & your own traditions. In Korea, the Groom has to carve and paint a wooden duck as a present for the mother-in-law to impress and express his monogamous intentions to her. TRADITION: BLACKENING OF THE COUPLE. Some parts of Scotland have the happy couple liquored up, covered with flour and feathers. This tradition popularly knows as the ‘blackening ceremony’ is believed to scare off the evil spirits and bring sacred and positive energies in the life of the newly weds. German newly-weds showcase their compatibility by sawing a log together. In Indian weddings, the bride’s sister and friends steal the groom’s shoes on the wedding day and hide them. The guests from the bride’s side take part in the negotiation of how much money should be paid by the groom to get his shoes back. There’s a major Bollywood song about this tradition. The idea of confetti in Italian weddings doesn’t refer to little strips of paper but rather sweet treats like candy-coated almonds that are presented to the guests. The sugar coating is added to the bitter almonds in the hope that the newlyweds will have more sweet times than bitter during their lifetime together. Before a Russian wedding takes place, the Groom has to go to the bride’s family members and ask for her hand. He has to give money, presents and do dares like singing, dancing etc to prove his determination and eagerness to marry the girl. Being in a communist state like Cuba, weddings could be a pretty expensive affair. To collect enough money to sponsor a honeymoon the guests at the wedding do a money dance. Every man that joins the bride for a dance pins money on her dress. 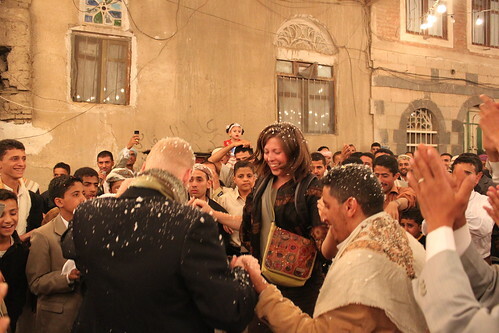 In Yemen, the father of the groom throws raisins on the ground for the guests to pick up. Raisins symbolize happiness for the happy couple. Crying is pre-planned a month before the Chinese wedding takes place. The bride is trained to cry for about an hour each day for a month before the wedding day. The female family members of the bride along with close friends join her for crying for several days. Previous PostPrevious STAY AWAY! These forbidden places are out of any traveller’s reach.